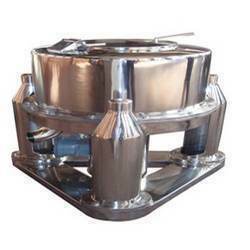 Owing to our adept professionals, we are engaged in manufacturing and supplying Chemical Centrifuge. Founded in the year 1995, we “Jay Mechanical Works” are the prominent Sole Proprietorship Company, devoted towards Manufacturing and Supplying the qualitative range of Storage Tank, Screw Conveyor, SS Bolt And Wing Nuts, MS Impeller, SS Staircase, SS Hooper, SS Products, Precision Machined Component, Industrial Clamps, SS And MS Strainer, SS And MS Stirrer, etc. Located at Vadodara (Gujarat, India), we are backed by a large infrastructural base that comprises of various divisions such as quality testing, production, procurement, sales & marketing, and warehousing. Under the enthusiastic guidance of “Mr. Rajendra Ahire” (Proprietor), we have been able to cater the various requirements of our clients.